I'm the first to admit I don't get as creative with my jewelry as I should. I pretty much stick to my every day pieces (gold watch, monogram necklace, pearl studs, Clemson ring) unless I'm going out at night. I feel like J. Crew has been a huge trendsetter in the jewelry game for a few years now- I'm sure everyone remembers the bubble necklace obsession that took over the blog world from a few years ago. (Sidenote: Thank goodness that's over!) 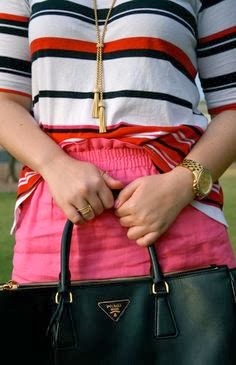 This past spring they introduced the tassel necklace and I've been seeing it more and more around the blogosphere. I love how luxe it can make even the most simple outfit look. Here's a little Pinspiration on how to style it from some fab ladies! I love tassel necklaces but everytime that I've tried one on in a store I feel like they make me look silly haha! :-) But they look SO cute on many fashion bloggers. My favorite types of necklaces are blingy and colorful statement necklace- perfect way to jazz up a plain t-shirt and cardigan!